YAY! 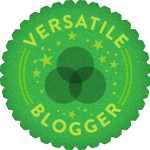 I got another blogger award! LOVE IT! I would like to thank the Lovely and wonderful Ariel Avalon for nominating me! There are a few rules one one must follow before accepting the award and they are as follows. 1. Nominate 15 fellow bloggers who are relatively new to blogging. 1. I LOVE exclamatin points and use WAY too many!!! 4. One day I want to travel the world! Ireland, Italy, Spain, Germany and Australia are ALL a must! 5. I dream of one day being able to spend an entire day WRITING! 6. I want to grow old with mu husband and be able to watch our grandchildren and great grandchildren play in our front yard! Yup- super sappy romantic here! 7. Even though I have only been blogging for about 2 months, I AM OBSESSED with it! and So freakin glad I started because I have learned SO much! 4. Do You have Chicken for My Table?